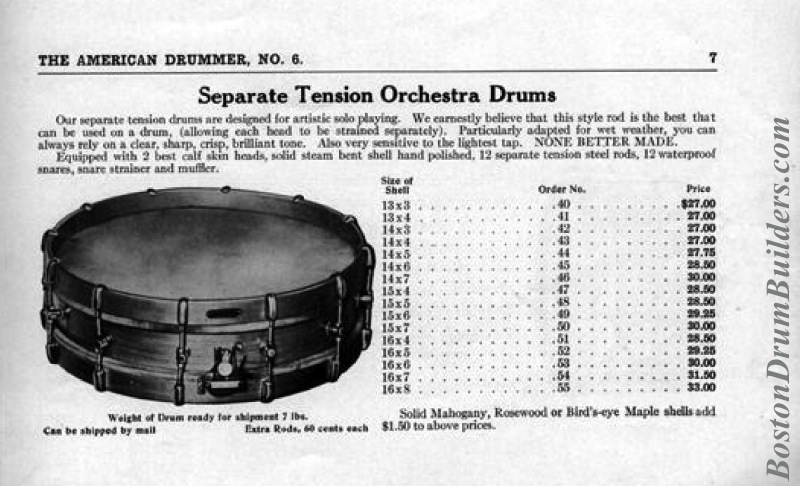 Pictured here is an exceptional example of a Nokes & Nicolai Separate Tension Orchestra Drum along with the corresponding catalog page from "The American Drummer No. 6", ca. 1918. 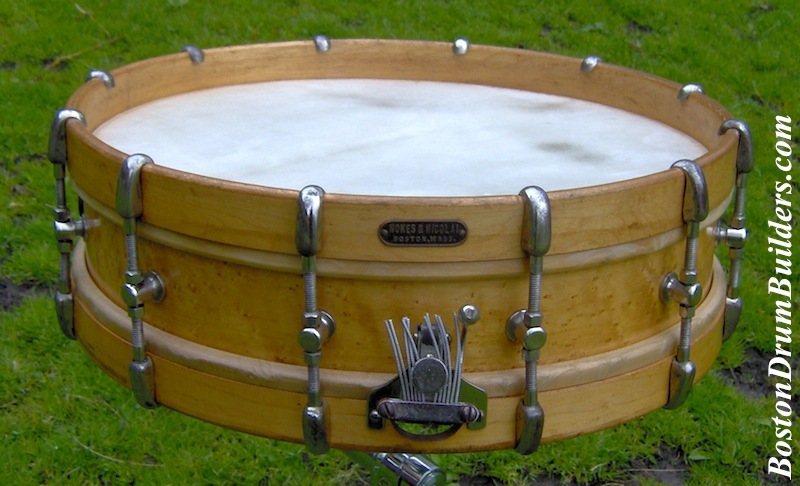 Nokes & Nicolai's wooden shells were typically single-ply maple but were also available in rosewood, mahogany, and bird's-eye maple (seen here) at an additional cost. 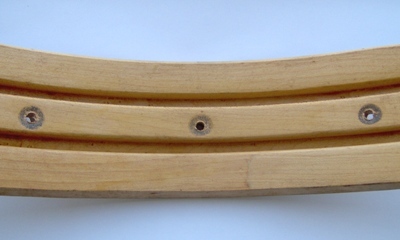 This shell measures 3" x 14" and utilizes three solid maple re-inforcing rings inside. The seam in each re-inforcing ring is placed equidistant from the other two to give the shell added stability. The hoops are formed from single-ply maple with the Nokes & Nicolai black enameled brass badge tacked onto the top hoop. 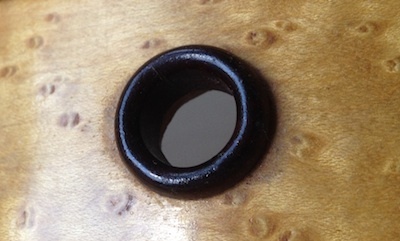 The shell's air vent is lined with its factory original rosewood grommet. 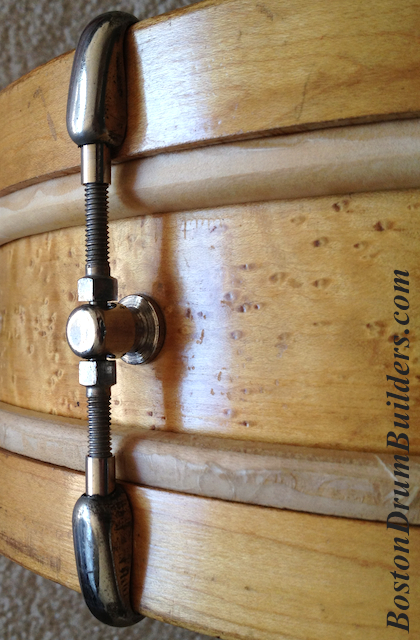 (click to enlarge) Nokes & Nicolai's separate tension drums employed a unique tensioning method allowing each head to be tuned independently by adjusting the tension rods with a wrench near the center posts. Stamped metal hooks attach over the wooden rims and house swivel nuts into which the tension rods feed. The posts are formed from milled brass and allow the rods to turn freely. Tight fitting stamped metal caps cover the posts giving a more finished appearance while keeping the tension rods in place when not under tension. 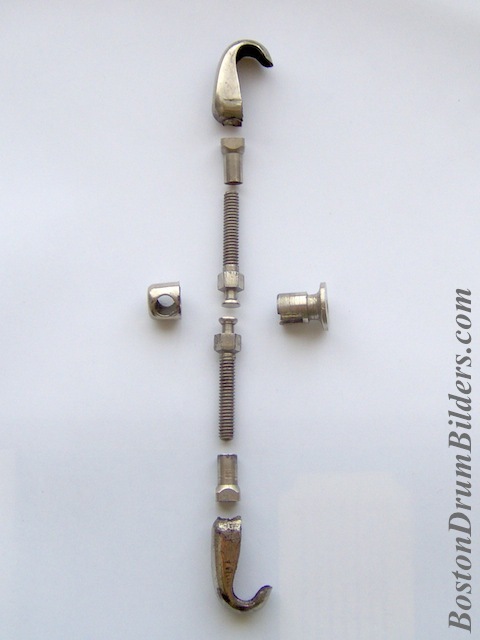 All of this drum's hardware is nickel plated and is fairly well preserved. Some early examples of the Combined Snare Strainer and Muffler (pictured below) used by Nokes & Nicolai had the words "PAT. APLD FOR" stamped into the outward facing plate used to clamp the snare wires into place. Later examples had no wording suggesting that no patent was ever granted. The mechanism is a true snare throw-off capable of fully disengaging the snares from the bottom head or 'muffling' the sound of the drum. The strainer is attached to the bottom hoop with two small wood screws, one on each side of the semi-circular snare gate. 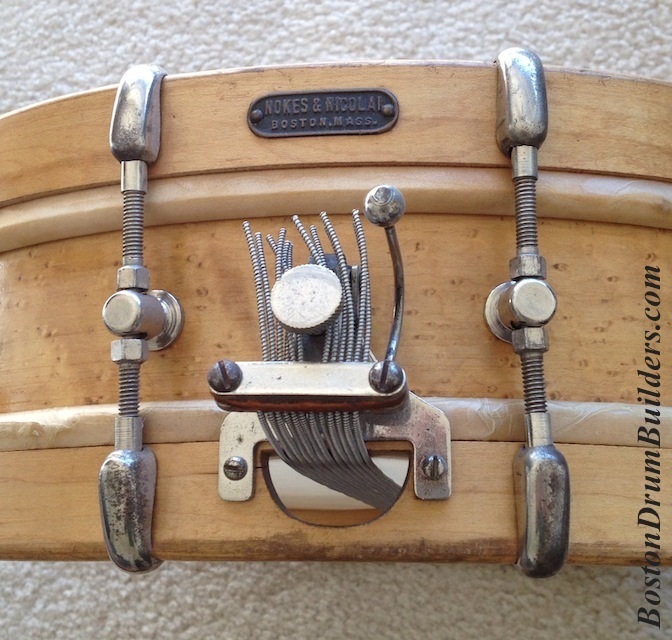 This drum is outfitted with reproduction wire wound silk snares from Adrian Kirchler.